A match quality ammunition for the 7.62x54R that is normally utilizing mil surplus (and old production at that). From the original date of manufacture there has been an inherent accuracy o the cartridge that hasn’t necessarily been optimized in the ammunition or rifle platforms that the cartridge is utilized heavily in. This cartridge takes that gap between potential and production, and shortens it significantly. The Sellier & Bellot load with a premium projectile – in this case a Sierra Match King 174 grain bullet – makes legitimate sub MOA a possibility with certain rifles in certain conditions. The real benefit here is the factory load and the ability to reload the brass which won’t make up for the price difference between this match quality ammo and the milsurp stuff you can find in the spam cans (if you can find it). It’s a pretty good start though, with the added bonus of the premium bullet and the very consistent load because of high tolerances and accurate powders that seem to be very clean burning in comparison to the mil-surplus stuff. Suitable for use in any 7.62x54R rifle, but particularly well suited for sporterized/accurized surplus rifles or those built with high tolerances from the factory (e.g. Dragunov and clones) with scopes or other optics. Q: I have a Mosin Nagant 1891/30 that prints awful groups at 50 yds with Wolf ammo. It is a stock rifle. Do you think this ammo will do better or that this type of rifle will just always print bad? A: This ammo will certainly allow you to reduce the chances that ammunition is to blame for the accuracy issues, but some Mosin Nagants simply do not shoot very precise or accurate groups, even with good ammo like this S&B 174gr HPBT Match. 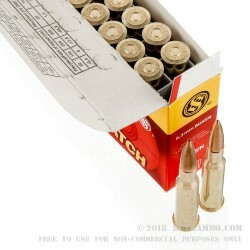 Q: Do you sell this ammunition in larger quantities, or only in the 20 round boxes. A: At this time, we only sell this ammunition in 20rd boxes. If demand increases, we might offer it in a 200rd case quantity. However, this does not prevent you from ordering as many as we have in stock. A: No, this is a smaller production load not currently available in the sealed cans. Q: Is there any specific 7.62x54 ammo brand whose rim is designed in any way to help prevent "rim lock" with mosin nagant rifles? Is this even possible or is all 7.62x54 the same? A: The rifle itself is designed to prevent this - if it occurs, the rifle is broken or malfunctioning and needs to be fixed by a gunsmith. All 7.62x54R brass and steel cases should be made to the same dimensions. Q: I recently purchased a Mosin Nagant. I decided to buy it for a few reasons - historical value, price and it would be a rifle that I could hunt large game with. 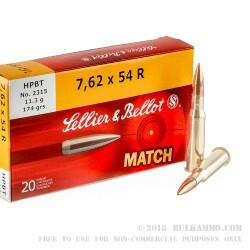 Would this Sellier & Bellot ammo be legal to use when hunting? I heard that you could not use surplus ammo for hunting which is what I have. If this is the case could you also explain why surplus ammo is not allowed to hunt with. (Sorry if this is a dumb question, but I am a beginning hunter.) Thanks again for your time and for supporting the TSP! A: This is not a dumb question and you are to be commended for wanting to buy the right ammo for hunting instead of making a choice that might not be legal or proper/ethical for hunting live game. Yes, this Sellier & Bellot ammo would be legal for hunting. 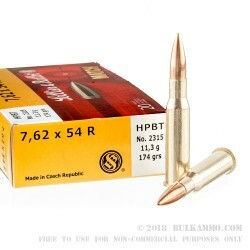 However, you might want to choose a soft point over this 174gr HPBT. This bullet is intended for target shooting, and has a good chance of performing just like FMJ ammo would in a deer or other animal. 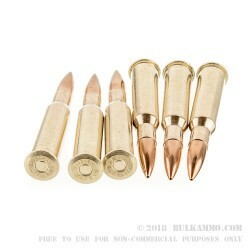 Surplus ammo is not prohibited just because it is surplus, but because the FMJ bullets mandated under various amendments to the Hague Convention - setting down rules for land warfare - are really not very good for killing things. Thus, for hunting purposes, FMJ is a poor choice that can result in a wounded animal instead of a quick and ethical kill. Q: Do you ever get in large sealed cans of 7.62 x 54r? A: We do, but not with 174gr Sierra MatchKings.